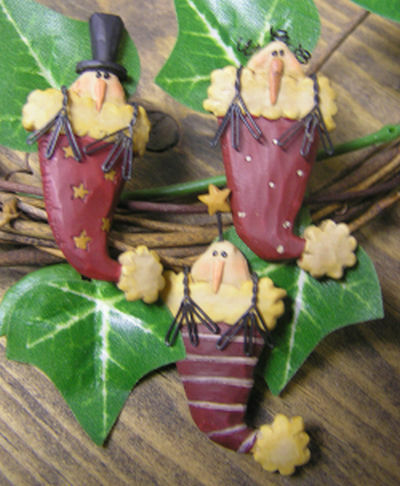 Manchester Cottage offers a wide variety of pins with many of them our original designs. 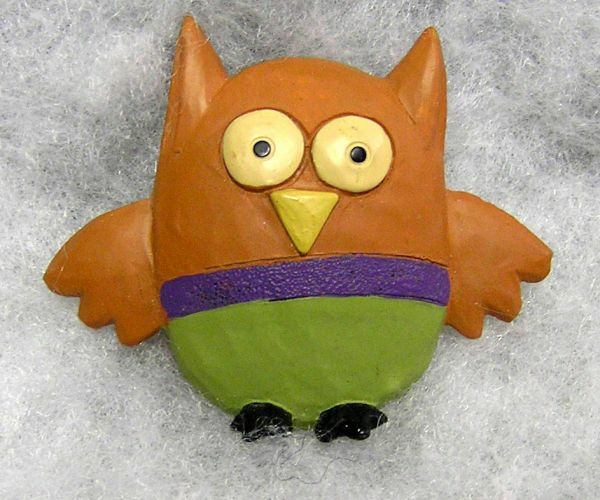 Our pins make a nice gift, package decoration, or something just for you. The cost of the pins is $2.50 with postage just $1.50 each! Have fun shopping! These cute resin stocking pins come in three styles: Red/White, Green, and Red/Green. They measure 1 1/2 x 1 1/4 x 1/2. 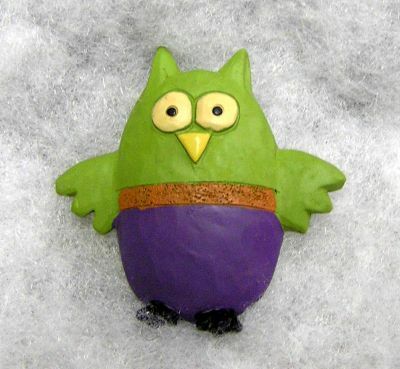 These cute owl pins come in two styles: Purple/green (shown) and Tan/green (click on photo to see this option). They measure 1 3/4 x 2 x 1/2. 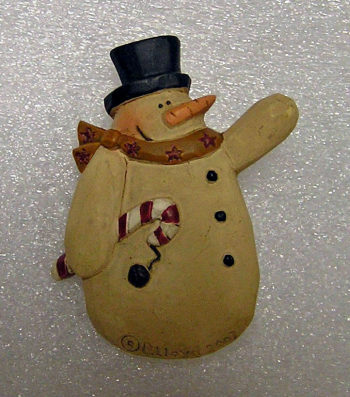 This adorable resin pin features a happy snowman with a carrot nose, top hat, scarf, and candy cane. He measures 1 1/2 x 1 1/2 x 1/4. 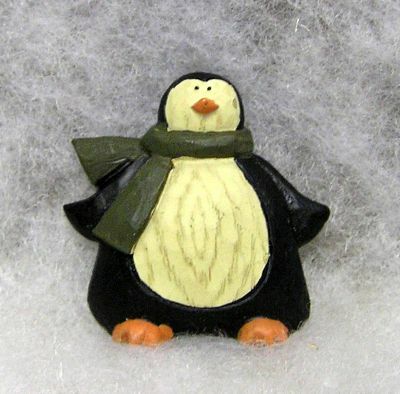 This cute little resin penquin pin features a scarf around his neck, little feet peeking out under his belly, and a pointy orange beak. He measures 1 3/4 x 1 1/2 x 1/2. 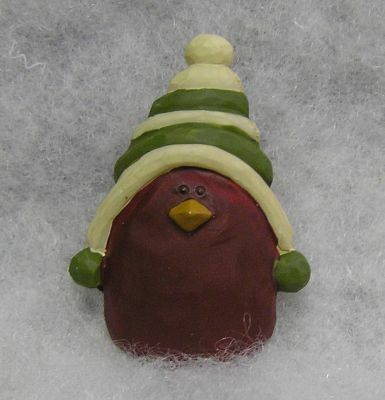 This cute little red bird features a winter hat with pom pom ends. He measures 2 x 1 1/2 x 1/4. 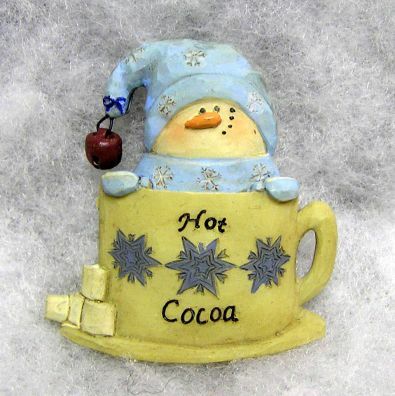 This snowman is sitting in a cup of "Hot Cocoa". He has a cap with a bell, scarf, and mittens and there are some marshmallows along side the cup. It measures 2 x 2 x 1/4. 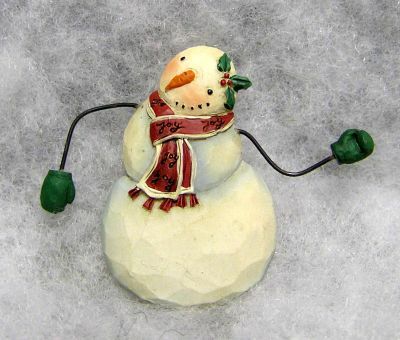 Little wire arms with mittens are part of this resin snowman pin. He also has a scarf and holly on his head. He measures 2 x 2 x 1/4. 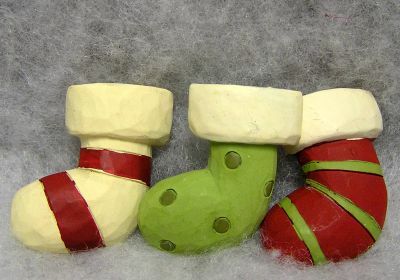 These resin snowmen are tucked away in a santa hat. They have wire arms and hats. They measure 1 3/4 x 3/4 x 1/2. 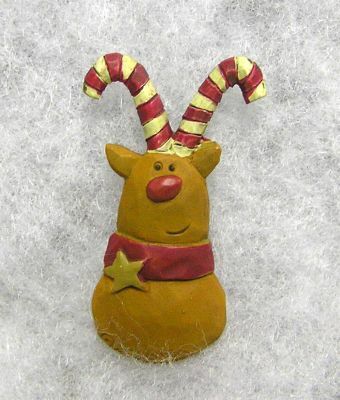 Little striped antlers are on the head of this reindeer. He also has a scarf with a star on it. It measures 1 3/4 x 1 x 1/4. 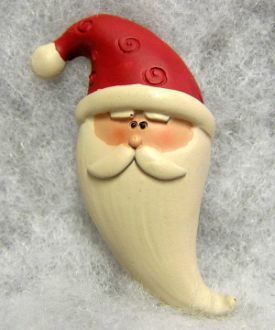 This resin pin is a santa head with hat and big white beard. It measures 2 x 1 x 1/2. Our rustic metal key pin is hand painted with our own santa design. 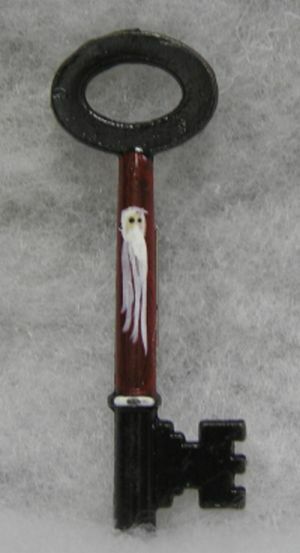 It comes with a card that has the story of the santa key which tells you that this is a special key that santa uses to deliver toys to homes without chimneys. This pin measures 2 1/2 x 1 x 1/4. 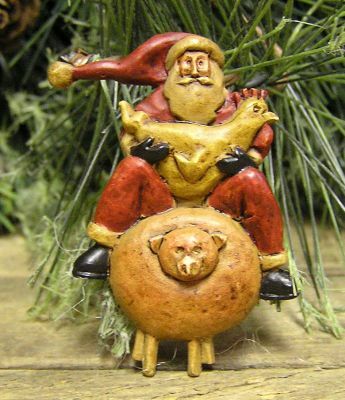 Santa is sitting on a pig and holding a chicken in this cute antique finish resin pin. It measures 2 x 1 1/4 x 3/8. 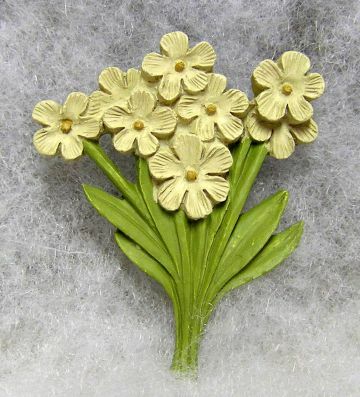 This beautiful pin features a bunch of cream colored flowers and leaves. It measures 2 x 1 3/4 x 1/2.